Mac users have a small question of how to set alarm on mac and is there a way for setting alarm on mac and can you set an alarm on a mac??? Probably mac users have this inbuilt facility, none of the other apps are required to set alarm on mac. We can set alarms for birthdays, wake up calls, reminders, meeting calls with one-time alarm feature. Check the below process to know how to set alarm on mac devices. 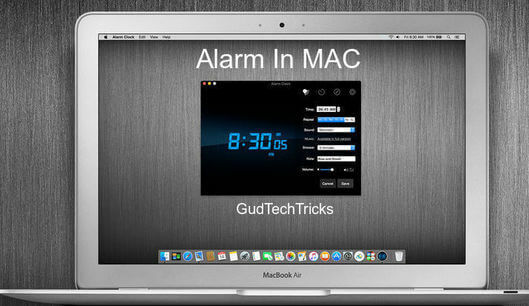 With this setup even your mac can alarm or wake you up at time. Here are steps for setting alarm on macbook. Follow the below steps carefully for how to set alarm on macbook. First go to Dock,Click on the Calendar icon. If the calendar icon is not visible in doc, then go to Menu >> Applications >> Double click Calendar. Now double click on Date you want to set the alarm. Set a name for the alarm in New Event text area. Select the date and time in the From: field. Don’t set the To: field. Select the Alert: drop-down menu and click on Custom. Choose the Message with sound option from the drop down menu. Here you can select a sound for your message in the list. Next click on Open File and choose a audio file on your hard drive to play the alarm. Select At the Time of Event from the menu and click on OK. You can also set the Minutes before and enter the minutes in value. Set the event time. Finally your alarm will be set and it will ring on the date . You can set an alarm on mac for the events and birthdays, for that you can check the below steps. First go to the calendar app, choose the calendar menu and click on Preferences from the menu. Choose Events >> At time of Event. Now choose birthday and set the time for when you need the alarm. If you want to set these alarms on your iphone and ipads too then Uncheck “Use these defaults alerts on only this computer”. With this you can save and set the alarm clock on mac and also use them in your ios devices too. There are some of the best alarm clock for macbook, if you are not interested to change the settings on your macbook then you can see some of the some that will set alarm on mac. Below are the apps check out them. With these apps you will know how to set alarm on mac. 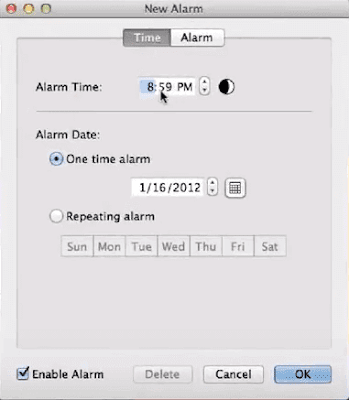 With this article many of the users can solve their query can i set an alarm on my mac. For any issues comment us in below section.